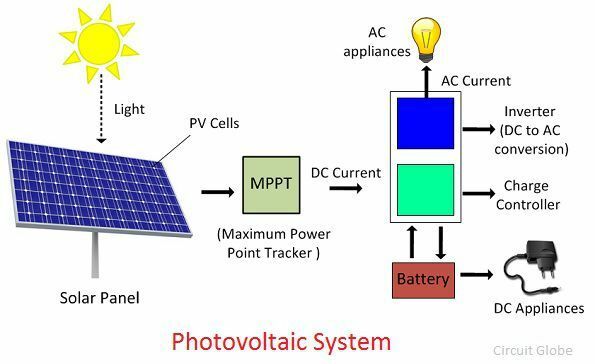 Definition: The Photovoltaic cell is the semiconductor device that converts the light into electrical energy. The voltage induces by the PV cell depends on the intensity of light incident on it. The name Photovoltaic is because of their voltage producing capability. The electrons of the semiconductor material are joined together by the covalent bond. The electromagnetic radiations are made of small energy particles called photons. When the photons are incident on the semiconductor material, then the electrons become energised and starts emitting. The energises electron is known as the Photoelectrons. And the phenomenon of emission of electrons is known as the photoelectric effect. 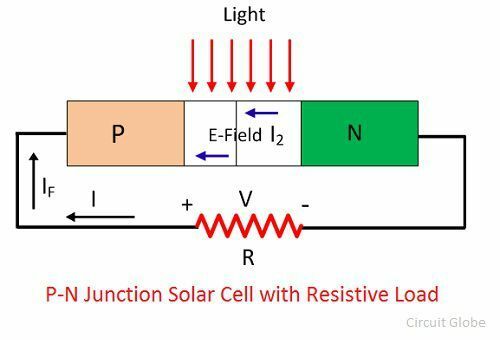 The working of the Photovoltaic cell depends on the photoelectric effect. The semiconductor materials like arsenide, indium, cadmium, silicon, selenium and gallium are used for making the PV cells. Mostly silicon and selenium are used for making the cell. Consider the figure below shows the constructions of the silicon photovoltaic cell. The upper surface of the cell is made of the thin layer of the p-type material so that the light can easily enter into the material. The metal rings are placed around p-type and n-type material which acts as their positive and negative output terminals respectively. The multi-crystalline or monocrystalline semiconductor material make the single unit of the PV cell. The mono-crystal cell is cut from the volume of the semiconductor material. The multicell are obtained from the material which has many sides. 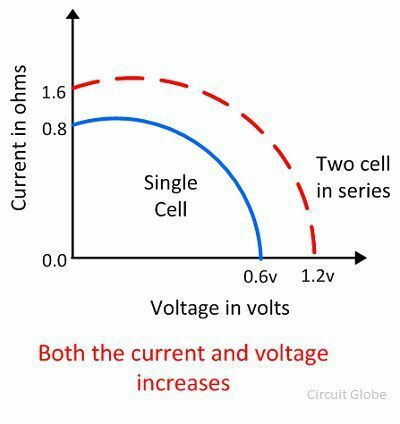 The output voltage and current obtained from the single unit of the cell is very less. The magnitude of the output voltage is 0.6v, and that of the current is 0.8v. The different combinations of cells are used for increasing the output efficiency. There are three possible ways of combining the PV cells. 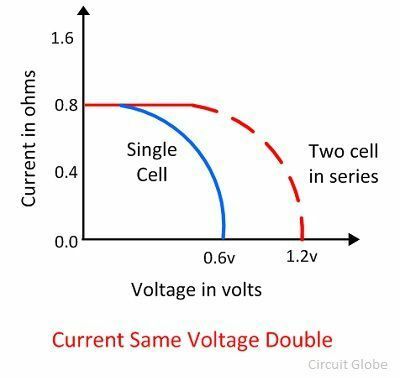 If more than two cells are connected in series with each other, then the output current of the cell remains same, and their input voltage becomes doubles. The graph below shows the output characteristic of the PV cells when connected in series. In the parallel combination of the cells, the voltage remains same, and the magnitude of current becomes double. The characteristic curve of the parallel combination of cells is represented below. 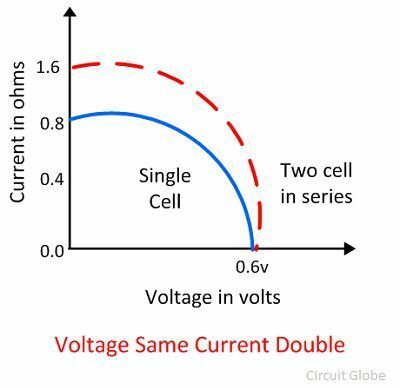 In the series-parallel combination of cells the magnitude of both the voltage and current increases. Thereby, the solar panels are made by using the series-parallel combination of the cells. The solar module is constructed by connecting the single solar cells. And the combination of the solar modules together is known as the solar panel. The light incident on the semiconductor material may be pass or reflected through it. The PV cell is made of the semiconductor material which is neither a complete conductor nor an insulator. This property of semiconductor material makes it more efficient for converting the light energy into electric energy. When the semiconductor material absorbs light, the electrons of the material starts emitting. This happens because the light consists small energise particles called photons. When the electrons absorb the photons, they become energised and starts moving into the material. Because of the effect of an electric field, the particles move only in the one direction and develops current. The semiconductor materials have the metallic electrodes through which the current goes out of it. Consider the figure below shows the PV cell made of silicon and the resistive load is connected across it. 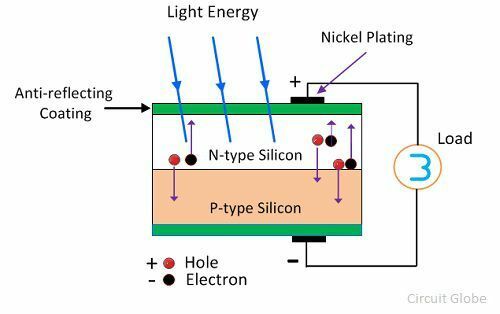 The PV cell consists the P and N-type layer of semiconductor material. These layers are joined together to form the PN junction. The junction is the interface between the p-type and n-type material. When the light fall on the junction the electrons starts moving from one region to another. How Solar Cell Install on the Solar Power Plant? Maximum power point tracker, inverter, charge controller and battery are the name of the apparatus used for converting the radiation into an electrical voltage. Maximum Power Point Tracker – It’s a special kind of digital tracker that follows the location of the sun. The efficiency of the PV cell depends on the intensity of sunlight fall on it. The power of the sun varies with the time because of the movement of the earth. So for absorbing the maximum light, the panel needs to be moved along with the sun. Thereby the maximum power point tracker is used with the solar panel. Charge Controller – The charge controller regulates the voltage drawn from the panel. It also protects the battery from the overcharging or overvoltage. Inverter – The inverter converts the direct current into the alternating current and vice versa. The conversion is essential because some of the appliances require ac supply for their work.